In short: Lightweight and balanced billet machined flywheel, for optimum performance! For whom: For those who want to maximize driveability and overall driving experience! Details: The automotive component most responsible for ensuring optimum clutch performance and life is the flywheel. The flywheel´s contribution to power transfer is three-fold. 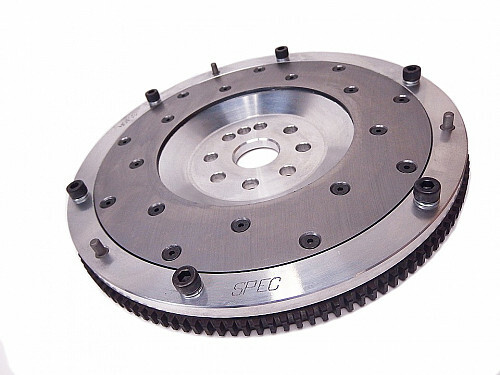 Firstly, the flywheel should provide a consistent and friction enhancing surface for the clutch disc. Secondly, flywheels aid in proper inertia, which is determined by the flywheel weight. Inertia controls the ratio of power to acceleration and can make a vehicle faster or slower based on gear ratio, tire type, vehicle weight, power output and even the location in the powerband output is achieved. The weight of a flywheel and amount of inertia it provides can also effect drivability. Lastly, the flywheel must provide a true balance at rpm, which means no dimensional runout that produces engine damaging and power robbing vibrations and allows smooth engine revolutions. To allow for specific inertia needs, SPEC flywheels are made in high carbon billet steel and aircraft quality billet aluminum. SPEC spends a lot of time and effort on research and development of optimum flywheel dimensions and weights for all types of driving and racing and can optimize your MOI (moment of inertia) to maximize your car´s output and performance.